My first introduction to L’Occitane was the first Christmas that I spent with Thomas’ family. That also marked the first Christmas that I’d ever spent without my family, which was definitely a little sad for me, but I was excited to join his family Christmas tradition. On Christmas morning, my stocking was filled with so many wonderful little gifts, with some of those being L’Occitane face cream and the shea butter hand creme. It started my love affair with the products, and my own gifting tradition with them. You might have seen this Instagram post I did a few weeks ago highlighting L’Occitane’s Advent calendar. As a child, we always looked forward to the start of our Christmas countdown and the mini chocolates that came with this. This year, I’m switching out the candy for another treat, beauty goods, as L’Occitane has theirs filled with minis of their most-loved products. It’s the perfect gift for any of the beauty lovers in your life, or even yourself! They also have an assortment of gift boxes that can ease the pressure of coming up with a special gift. 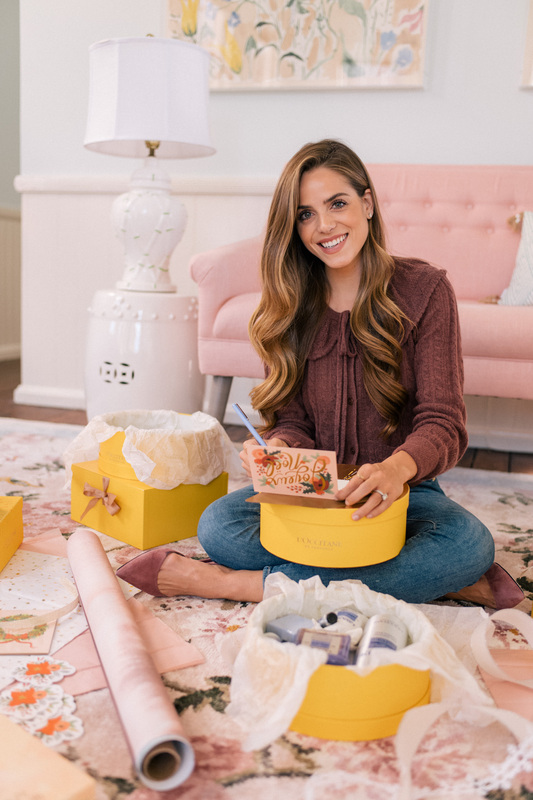 I personally love to sample different beauty products all the time, so I think this makes a great gift because each box comes with a collection of different products. The Lavender gift set is Thomas’ personal favorite. Not only does it remind him of the summers we have spent in Provence, but the aroma helps set a mood of tranquility and calm (and I have to agree!). Perfect for the person in your life that’s needed a little break from their busy life this holiday season. Some other great gift sets are the Shea for nourishing your skin, Almond for smooth skin, Terre de Lumiére for the fragrance lover and Best of L’Occitane for those that want to try a variety of products. Thank you to L’Occitane for sponsoring this post. Lovely post, Julia. I love the L’Occitane lavender bubble bath. L’occitane products are so nice and luxurious! L’Occitane’s holiday advent calendar looks and sounds like an absolute dream! Loving the photos! So many good ideas! My mom is always a fan of skincare products, I’ll be sure to take a look at this brand when shopping for her. Such a great holiday gift idea! Pretty too!! I would love to order that Advent calendar! What a fun idea!! Those gift boxes are so cute!! I love them. Such a great idea! Definitely going to create a few gift boxes like this! They do have great products! Their little hand wipes are great for travel and feel so wonderful! L’Occitane Christmas boxes are my fave to give as gifts to my friends! Those sets are so incredibly beautiful – I love all of their stuff. Nothing makes me happier (well…maybe jewels?) then bath items. Gift that gives all day! L’Occitane is one of my favorite brands! These are great gift ideas! Love this! Where is your top from? What a great post! It never fails that beauty products are a hit among my friends and family for christmas gifts. Plus, I always keep the extras for myself lol! Those little boxes are so cute and I love the vintage feel to them. These photos are so pretty! The L’Occitane advent calendar looks like an amazing gift. I love the shower oil! I’ve used it for a long time and I love how it warms up on the skin. So many great gift ideas! These are such cute boxes. This would even be a good idea for making and wrapping your own gifts for someone. Describe how communication breakdowns can occur when talking with an individual using an augmentative communication device. Describe some techniques for presenting such breakdowns from occurring. Well, the last two sentences were not suppose to be posted… woops, they were from my homework… my bad! We love L’Occitane and just did a post with them as well! In addition to some of the products you highlighted, they sent us these adorable little fire cracker boxes with min-products inside! Love this company and the wonderful skincare items they create! Such a great way to wrap a gift! Love the idea of giving a gift box! I like the lavender one too- I bet it smells so lovely! I like to give gifts of beauty products. It’s great way to share one’s favorite products! Cute wrapping ideas. so lovely. where is your sweater from? it’s such a pretty color!! I, too, would like to know where your top is from. It’s lovely! What a sweet way to wrap gifts for the holiday season! I love their hand cream so much! It really is the perfect little stocking stuffer to wake up to on Christmas morning! I have the same advent calendar it is so good! HI! Where is your couch from? Hi! Where did you get sweater? It is really really cute! Love this post and your jumper!